1. In the HTML file we will add the jQuery libraries and the stylesheets. As I said in the previous article, we need a div tag for the slider (radius_slider), a label (or, if you prefer, a span) to show the results from it in a nice format (radius_label) and a input that stores the actual result from the slider (with the ID the_radius). Because the search with a radius would be useless without a zip code, we will need a input for a zip code (with the ID the_zipcode). Same as the slider, the map will need a container in which it will be displayed (with the ID map_canvas). 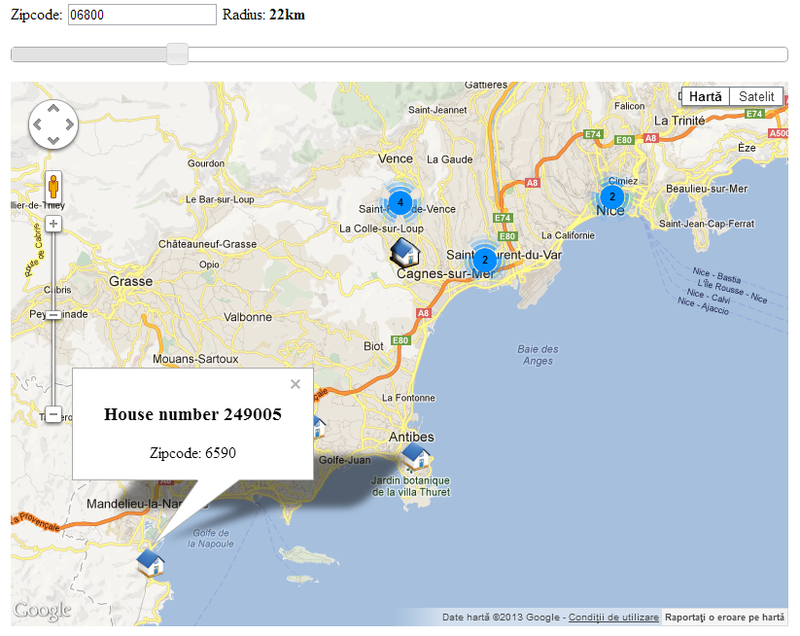 The first part is getting the locations with zip codes that match the search criteria (the given radius and zip code). This part makes the AJAX call to the PHP file to get the desired locations, the average longitude and average latitude (we will need this 2 at the initialization of the map). The second part consists of initialization of the map. Next we need to parse the location array and put each location in a marker. Each marker will have a title (it’s optional) and a custom icon (“small_icon.png” – it’s also optional). Here we also make a little HTML code for each of the windows that will open when clicking on the icon. In the end we need to add the markers array in a cluster (if there are a lot of items in the same place, they will be grouped under a cluster and the number of items in that cluster will be shown instead of a conglomaration of icons). The initialization of the radius is similar as the one from the previous article. For more details, please read the Dynamic jQuery Slider search. Here we also added a event to the zipcode input so each time this changes, we reinitialize the map with the new zipcode. You can download an archive with the code here. If you have questions or suggestions please write them in a comment bellow.